How did humble footy cleats become such technological marvels? While it may have been left lagging behind other sports in adopting video referees and goal-line tech - although we have seen a lot of this at the 2018 Russia World Cup - when it comes to futuristic footwear the beautiful game leads the way. From ultra-lightweight uppers for increased speed, to aerodynamic studs for greater grip, today’s football boots boast the sort of engineering you’d expect to find in the aviation industry. But how did humble footy cleats become such technological marvels? Below we chart the advancement of the football boot - from their origin as up-cycled workwear to the hi-tech kicks being sported by the likes of Ronaldo and Messi in Russia this summer. While more noted for his multiple wives rather than his fancy footwork, the first ever recorded reference to football boots are nevertheless from an inventory of Henry VIII's clothes when he died in 1547. Designed by royal shoemaker Cornelius Johnson and costing four shillings, the thick leather boots were said to have been ankle high and extremely heavy. As the game evolved over the next 300 years from the brutal, almost aimless hoofing of a heavy pig skin around a field without goals or markings of Tudor times, to a more organised sport with rules and tournaments, so did the footwear demands of those playing the game. With the game growing in popularity across Britain during the mid-19th Century, factory workers began modifying their long-laced, steel toe-capped work boots to improve their grip on muddy playing surfaces, often hammering tacks and nails into them. While these proto-studs improved the players balance and footing, they inevitably caused serious injuries for any player on the receiving end of a horror lunge from an opponent. The practice of makeshift grips was eventually outlawed by the newly established Football Association in 1863, with the FA decreeing that: "No one wearing projecting nails, iron plates or gutta percha on the soles of his boots is allowed to play." By the beginning of the 20th century, the demand for regulated footwear saw a number of sportswear brands we recognise today like Gola and Hummel begin to emerge as makers of studded football boots. One such company to enter the market at this time was the Dassler Brothers Shoe Factory. Best known for track and field wear (the German company’s athletic spikes were worn by Jesse Owens at the 1936 Berlin Olympic Games no less), by the end of WWII the factory had become one of leading brands for football boots. A disagreement between the two brothers following WWII saw them dissolve the company, with the pair setting up rival sportswear brands that would go on to dominate the football boot market. While the Dassler’s were having their fall out, the growing trend among high-profile players was away from the heavy, protection-focused ankle boot, towards lightweight, low cut boots as preferred by South American stars, which improved control as well as speed. The next major breakthrough would come with Puma’s 'Super Atom' in 1952 – the first manufactured football boot with interchangeable studs which could be changed to suit different conditions. The ground-breaking boot would be worn by half of FC Kaiserslautern’s championship-winning team the following year. Adidas would go one step further. Its take on the screw-in studded boot, the Argentina, would be worn by the entire West German football team, with their long nylon studs cited as helping them win their first World Cup in 1954 ,after seeing off Hungary 3-2 during a rain-soaked final in Switzerland. By the 1960s player power was beginning to have an influence on the game and in turn football boot design. The likes of Bobby Moore (Adidas Diamant) and Portuguese legend Eusebio (Puma King) both wore custom made boots as part of endorsement deals during the 1966 World Cup. Pele would pick up a cool $125,000 cheque to wear Puma Kings during the 1970 World Cup, with the Brazilian infamously asking the referee for a moment so he could tie his laces, guaranteeing that the TV cameras were pointed at his sponsored shoes during his side’s triumphant win over Italy in the final. Up until this point, boots had predominantly been a uniform black colour, but a trend for dazzling designs would begin during the 1970 Charity Shield between Everton and Chelsea. Looking to make an impact in the UK, German firm Hummel sponsored Everton star Alan Ball, arranging for him to wear white boots that would stand out during colour TV broadcasts of the match. Unhappy with the fit and feel of boots, Ball would in fact wear a pair of spray-painted Adidas boots with Hummel’s chevrons sewn on the side. The late seventies saw the introduction of arguably the most popular football boot of all time. Designed for the forthcoming Spain 1982 World Cup, Adidas’ Copa Mundial featured tough kangaroo leather, moulded studs, and a foam-cushioned instep. 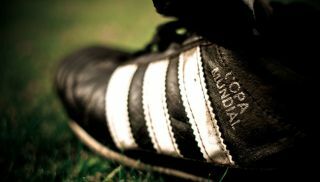 The boot would become the weapon of choice for the likes of Paolo Rossi, Diego Maradona and Zinedine Zidane and also proved popular with Rugby players. It remains part of Adidas boot line-up today. There would be a wait of almost 15 years before the next great leap in boot engineering. Once again it would come from Adidas, but this time via a somewhat unlikely source. A key member of Liverpool’s imperious late Eighties side, Australian midfielder Craig Johnson turned inventor after retiring early from the game to care for his ill sister. During a coaching session teaching young players how to curl the ball, Johnson hit upon an idea to attach rubber strips from a table tennis bat to the forefoot of his boots, instantly improving the amount of spin and power that could be applied to the ball. The concept of a shoe with rubber strips on the instep was eventually licensed by Adidas for their Predator boot range in 1994 which would also feature Johnson’s pioneering Traxion soles - a hybrid of traditional studs or and blade grips, which enabled a player to turn in tight spaces and at high speed. Worn by the likes of David Beckham and Zinedine Zidane, the two ground-breaking concepts would change the design of football boots forever. Although having made football boots since the early 70s, it wouldn’t be until the Nineties that Nike would become a major player in the world of soccer. Supplying the kit for the then world champions Brazil, their star player Ronaldo would wear the brand’s first truly classic boot during the France 98 World Cup. The Nike Mercurial would bring innovations such as lightweight 'synthetic leather' and a sticky outer layer adapted from racing motorcycles tire materials to enhance the touch and feel of the ball for players. As well as helping improve player speeds, modern boots were also recording just how fast they were running. Heralded as a boot with a brain when it was introduced in 2011, the Adidas adiZero F50 miCoach featured a built-in sensor chip that could measure average speed, maximum speed, number of sprints, and distance covered. The new century brought about something of an arms race between the main manufacturers to build the lightest boot humanly possible. Adidas and Nike would both incorporate their newly developed high tech knitted material from their running shoes into their soccer lines, heralding the age of the mid-cut 'sock boot', with the likes of the Nike Magista and the Adidas Primeknit FS having the stated aim of a tighter fit to match the actual contours of the player’s foot. A smaller footprint of a different kind was being offered by Nike with its limited edition GS boot in 2012 - an ultra-light football boot featuring components made from beans and recycled plastic. Meanwhile 2016 saw Adidas introduce the ACE 16 + Purecontrol, a super-svelte boot that did away with laces, instead using a discrete locking system for a glove-like fit. For this year’s World Cup in Russia there remains a trend for mid-cut boots as exemplified by the limited edition Nike Mercurial Superfly 360’s Ronaldo is set to wear - offering a slight nod in the direction of the innovative ankle boots worn during the early days of the game.